We only had five days on Canada’s PEI, but we kept this in mind and tried to do it justice. Yes, it is this pretty everywhere. 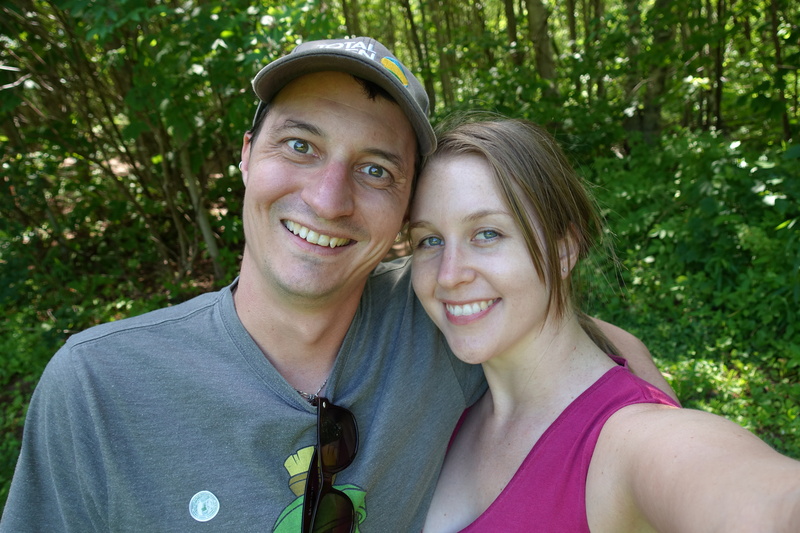 Armed with a car for the first time, and with Stu screeching “LANE” every time I almost went off the road – driving on the ‘wrong’ side is weird – we made it the six hours from Bangor to the Island with marriage intact. Barely. The entry from mainland Canada is made via the 13-kilometre Confederation Bridge over Northumberland Strait, of which Islanders are justifiably proud. It is uncanny to drive a narrow strip of concrete over so much sea, unable to see land ahead or behind. I half expected to see a giant cinematic kraken to rear over the parapet at any moment and grab us, sinking back into the watery depths with car and occupants clutched in its maw. 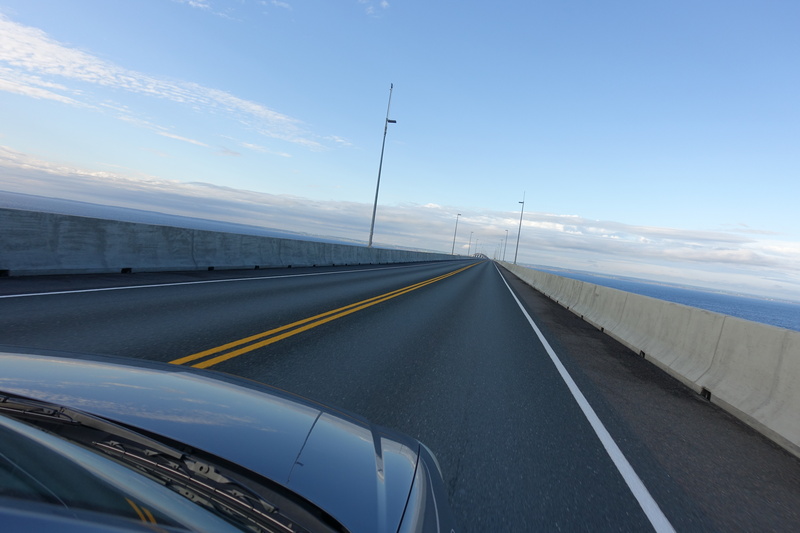 Confederation Bridge is a long-arse bridge. We made it over the bridge without being nabbed by any sea monsters and commenced a week of avid sightseeing informed exclusively by the works of Lucy Maud Montgomery, author of not just the Anne of Green Gables series but the Emily of New Moon and Pat of Silver Bush series, all set on the island the author grew up in and read almost to pieces throughout my childhood. Not to mention periodic re-readings throughout adulthood; whenever escape, consolation or inspiration was required. Some of my most beloved books. Islanders are dead proud of Montgomery, so Anne-inspired tourism is easy. 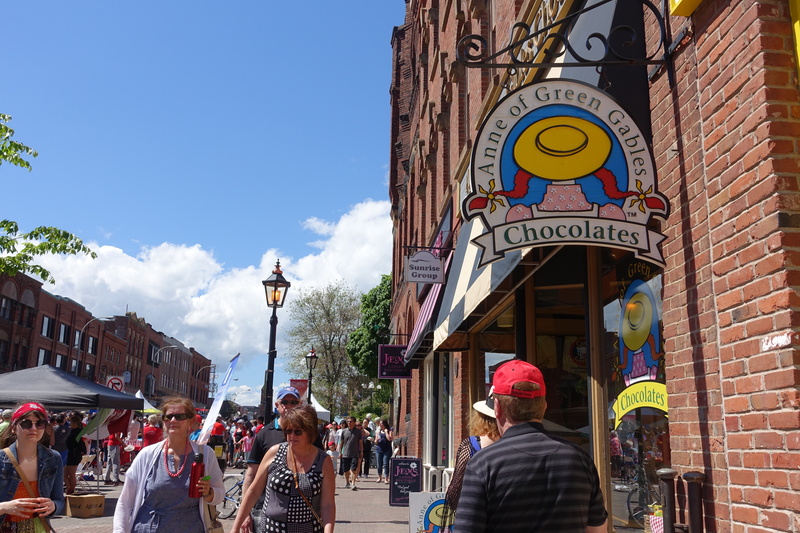 In the island’s capital of Charlottetown, where we stayed, there is an Anne gift shop and Anne-inspired chocolate shop, despite chocolate having nothing to do with, well, anything. You can attend the annual Charlottetown Festival season of the musical Anne of Green Gables – Canada’s longest-running musical at more than five decades – or the newer Anne and Gilbert musical, part of this year’s Festival. Proudly cashing in since always. Leaving Charlottetown, you can do a scenic coastal drive comprising a few hundred kilometres around the circumference of the middle third of the Island, the centre stretch of which takes you into Cavendish, which inspired the fictional village of Avonlea. 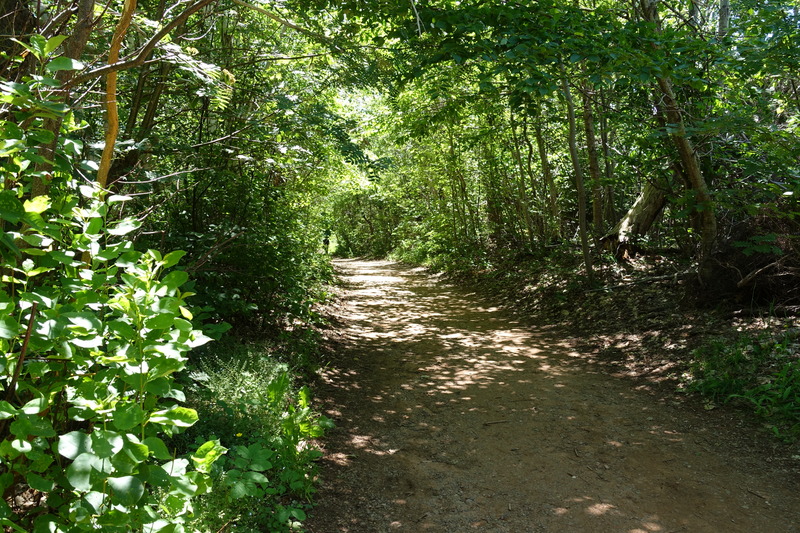 You can see the author’s aunt and uncle’s house, which inspired Green Gables, and the accompanying woodlands rendered in the series as Lover’s Lane and the Haunted Wood. You can see the site of her childhood home at the end of the walk through the Haunted Wood. You can visit White Sands Hotel (actually called Dalvay By the Sea) where Anne did her first recitation. You can visit the post office where Montgomery and her family worked and Montgomery’s gravesite nearby. 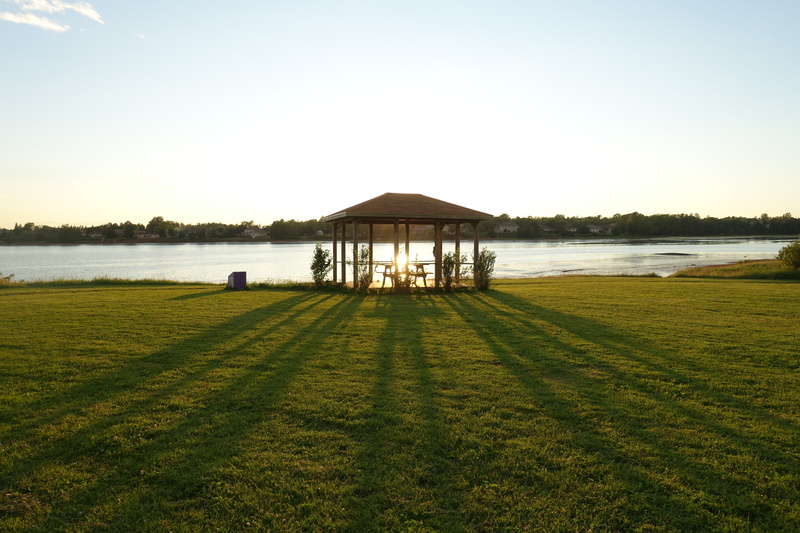 You can visit the little house she was born in, then her cousins’ house in Park Corner, the location of her wedding as well as the inspiration for Silver Bush and the pond 12-year-old Anne Shirley christened the ‘Lake of Shining Waters’. Lover’s Lane: everything I wanted it to be. Every single stop carries its own faithfully detailed museum devoted to Montgomery and (bar the musicals) we did it all. In one day. Yep, Stu’s a trooper. He followed me around, looking tactfully aside when I burst into emotional tears upon entering the grounds of Green Gables. He took photos of trees. He shouted LANE when I nearly drove the car into every ditch on the roads in between stops. He took countless photos of me, obediently deleting those I said I looked fat in. Speaking of princes, this one is the best. While the Gables was so thick with tourists you could do little more than shuffle along the conveyor belt and peer into the themed furnishings, which seemed much more elaborate than they actually were in the novels or in Montgomery’s day, Lover’s Lane and the Haunted Wood did not disappoint; as beautiful, as meandering, as inspiring as my inner child could ever hope for. The site of her childhood home was breathtaking, the gravesite she had chosen herself lovingly tended nearby, overlooking the dunes, harbour, pond and shore she loved. 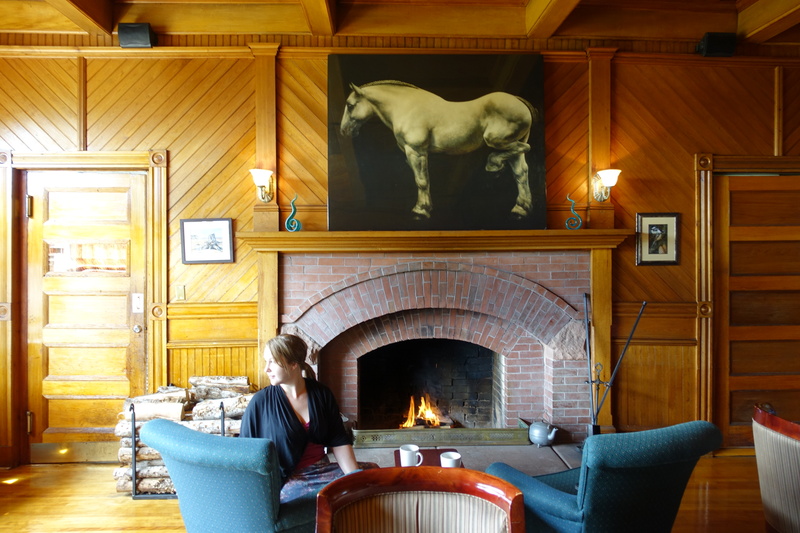 At the fittingly sumptuous Dalvay By the Sea, where Canada geese fossicked along the shores of the pond outside, we only stopped for coffee but the staff insisted on lighting a fire for us in the room we chose to sit in, upping the romance factor considerably. Having a fire lit especially for you: now that is service. I did feel the museums glossed over the facts of Montgomery’s death at age 67, which her family many years ago publicly confirmed was suicide. This breakdown and death followed the long period the author had silently coped with the societal pressures of being a minister’s wife, the personal pressures caused by her husband’s incapacitation due to chronic depression, and the anguish caused by the destructive behaviour of one of her cherished sons. I had researched these details for myself, having seen only hushed hints at them buried in dim corners of the otherwise extensive museums. For days afterwards I contemplated at length the awful, lonely end for this woman who had illuminated life for millions of people. I devoted the rest of the week to spending as much time outdoors as possible, going for long walks, appreciating the landscapes she loved and trying to reconcile the image of the joyful nature worshipper with the image of someone who eventually drowned in their own despair. 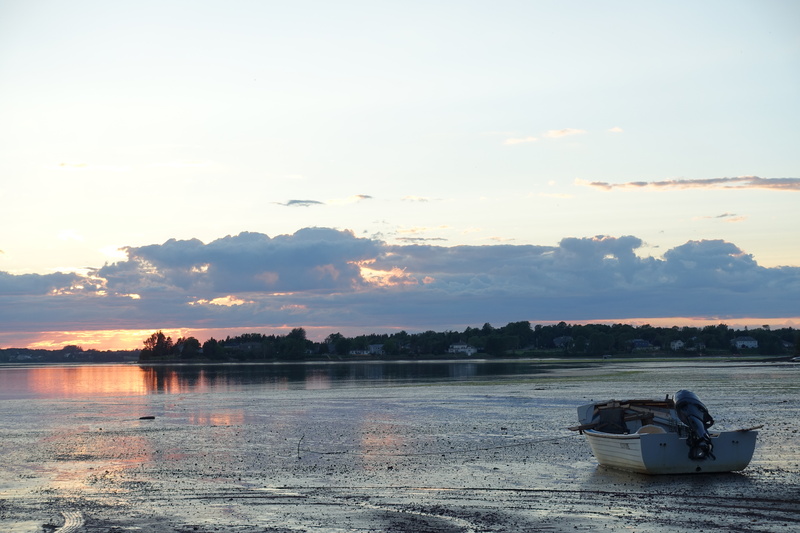 A sunset walk on a beach in Charlottetown. A person’s interior life is never as simple as the one they present to the world – but it takes both light and darkness to make a life. Darkness, trauma and loss was always acknowledged in Montgomery’s novels, and I thought these museums should have honoured her entire life, not just the beautiful parts. But the beautiful parts were certainly honest; the glowing descriptions were justified every day we spent on that island, though if I ever see Montgomery in heaven I am going to have to ask how she coped on those long romantic rambles when it was mosquito season. The one hurried photo we were able to take on our hike. Big, terrifying, angry mosquitoes plagued the forests that were full of water, it being springtime, and pursued us relentlessly. 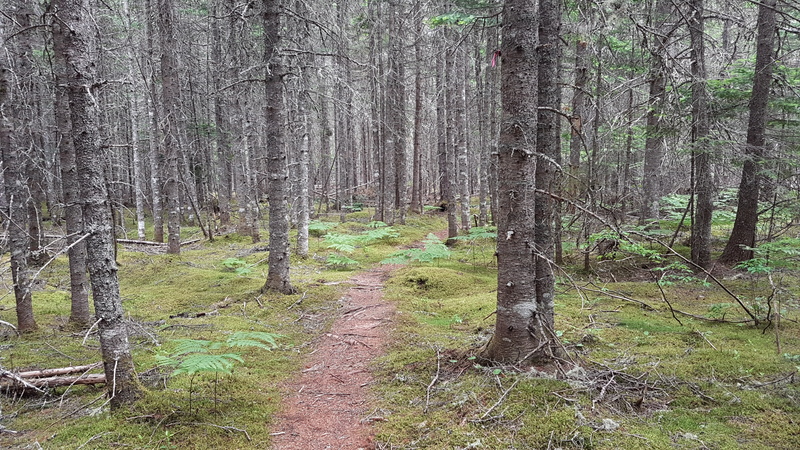 One ill-fated hike, intended to be 15 kilometres, we cut to about 10, skipping great swathes along the way, unable to stop and appreciate the fairytale woods around us, the wild orchids and berries, the mossy forest floors, as these evil mosquito overlords drove us from their territory. We could not stop to rest, drink in scenery or snap photos. We practically ran the 10 kilometres, pausing briefly twice in open country to pour more repellent on ourselves (half a large bottle used that one morning). By the end of the hike we were essentially fleeing those beautiful woods as though it were wolves, not mozzies, at our heels. THANKS FOR THE WARNING LUCY MAUD. Sticking to the shore from now on. We did not attempt the woods again, but stuck to the coastal areas unbothered by marauding beasts, just soaking in the rest of the scenery PEI is famous for: new crops being sown in freshly ploughed fields of iron-rich red soil, beside roadsides lined with lupin flowers that have become iconic despite authorities’ helpless annual attempts to hack them down as weeds messing up the drainage system. There is water everywhere – ponds, streams, river crossings around every bend in the road, fishermen tending the lobster nets that, alongside Anne, form another mainstay of the local economy. It is truly a magical place. We were sorry to leave and vowed to return. But there are consolations… next stop, New York City! Canadians can understand me! “Budweiser, please” produces a beer and a smile. Canada Netflix is different to US Netflix. Locals like it when you refer to US$ as monopoly money. Locals don’t like it when you pronounce it ‘Canadia’. It takes an intelligent, independent, successful, left-handed, blonde journalist about 31 years to master a can opener. PEI has the best greens. Everything is lush. Scones are called biscuits and they are served before meals with whipped cinnamon butter. Tasty. If you think of something, stop and do it because you won’t be back later. Locals doing bog laps in Charlottetown to the Spice Girls…. Because sometimes you wanna really really really wanna zig-a-zig-ah! Butter is too a snack food. Positive driver reinforcement yields better results when riding shotgun on the wrong side of the road than white-knuckled screaming. Back to the original Twin Peaks. 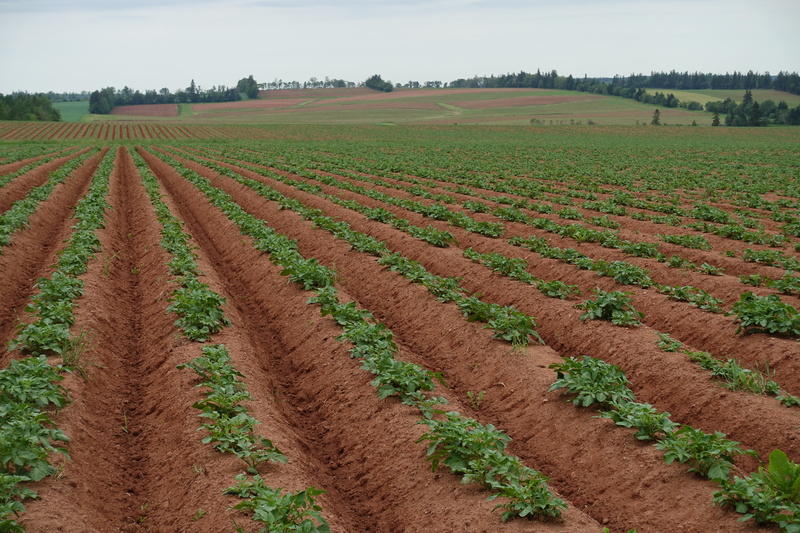 A typical PEI scene of roadside lupins and red ploughed fields awaiting planting. The gables! They are green! OK, so I cried more than once. At Victoria-by-the-Sea on PEI, on the Red Sands coastal drive. Drinking in yet another late evening sunset. This photo taken about 8.15pm! Stu’s photo of the outside of the home that inspired Pat of Silver Bush. We stopped short of actually taking a carriage ride with “Matthew”. This scene was enough. Lane between Montgomery’s childhood home, church and family business. Working at the post office enabled her to privately send off manuscripts without alerting the local gossips to her rejections – AOGG was rejected five times, and she only sent it off a sixth and final time on impulse after the manuscript sat in a hatbox for years! 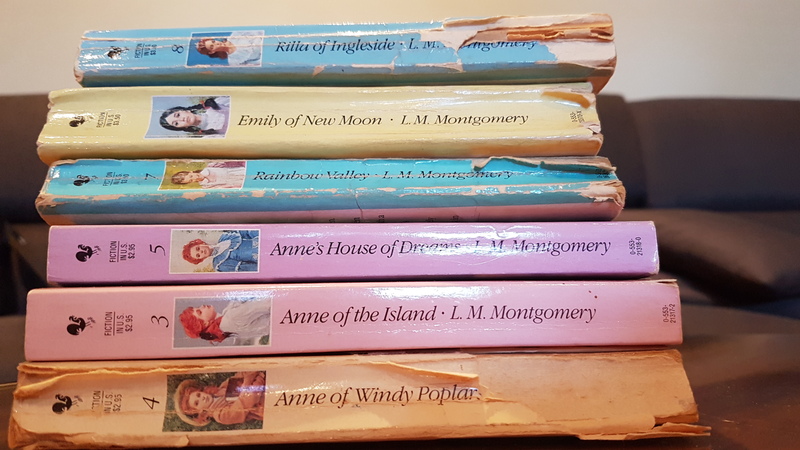 This entry was posted in (Vaguely) Literary Travels and tagged Anne of Green Gables, Avonlea, Canada, Cavendish, Charlottetown, Emily of New Moon, Haunted Wood, Lover's Lane, Park Corner, Prince Edward Island, Silver Bush, The Blue Castle by Emma Young. Bookmark the permalink. You guys make it sound wonderful and real. And I thought Kakadu had the worst mozzies! I’ve got tears. Beautiful. And Stuart – very funny. Stu is the comic relief! What a lovely piece Emma, I too had tears (weird??). Great stuff, I really look forward to all your posts!! Damn, that gal got CHOPS! Great writing, great photos. Thanks Grayden! Making an effort with the pics! Lover’s lane looks exactly the way I’d imagined it – love the video too! Now that you guys are back in the States, Stu, you need to acquaint yourself with biscuits and fried chicken, or biscuits and gravy (note, not the gravy we know, but rather something which is really closer to white sauce with sausage mince cooked through it… it sounds gnarly, but once you try it, it’s strangely compelling / actually delicious). Love it Emmy, felt the magic. Love that you could share that with Stu, and he is so gallant!